For the past few weeks I’ve just been hoping for cooler temperatures and rain. We’ve basically been waiting for summer to be over. It’s terrible really. Winter was so long, we were all waiting for the snow to stop and temperatures to rise. Before too long it was so hot and dry that the forest fires started and all we wanted was rain again. It’s hard to be content in this era of climate change that we are starting to experience. Nevertheless, it feels like fall is here and the fires are starting to settle down, which we are incredibly thankful for. You can see in the photo below that they aren’t out yet! 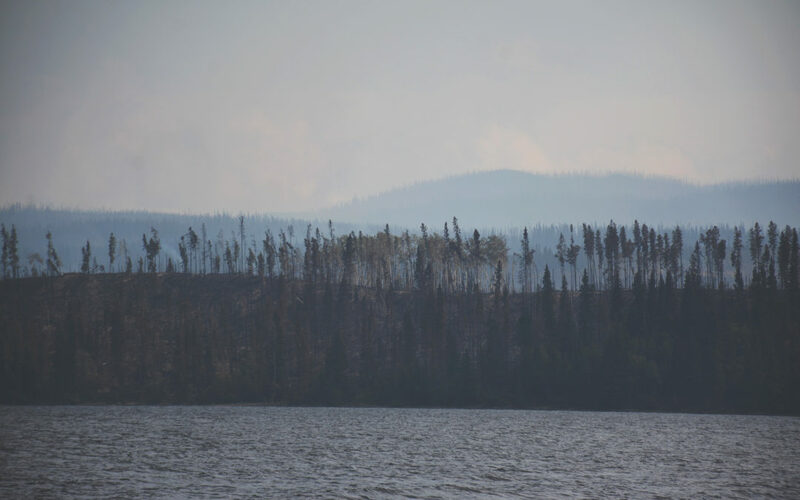 This was taken yesterday, looking to the Southside of Francois Lake where the Nadina Fire continues to burn. My family has been greatly affected by the Nadina Lake Wildlife this year. 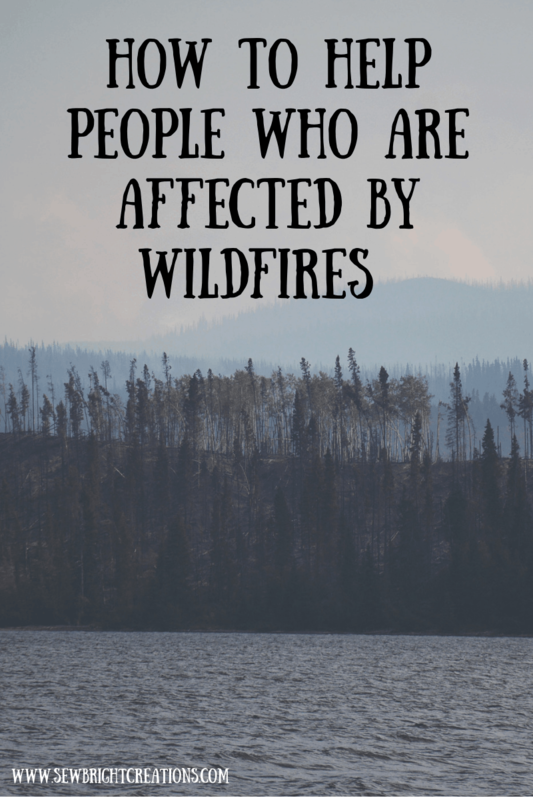 As I write this, the fire is still burning (now into September 2018), but we are super hopeful that the worst is behind us (although we have thought this several times). 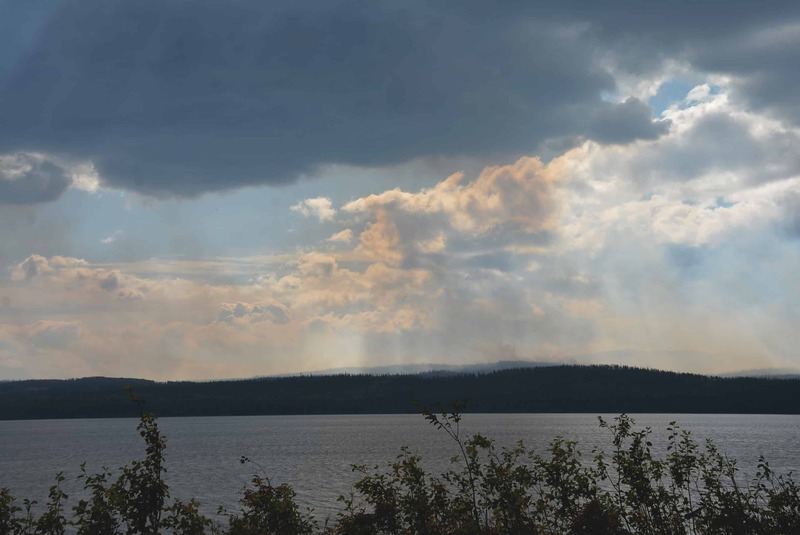 The fire affected both Nadina Lake Lodge, which celebrated its 60th year in business this year, all in my family, AND my parents house. Some people who were camping reported the fire to my parents and I phoned it in for them as there is no phone service there and I never imagined it would ever get this big. Over 85,000 hectares burnt. I know we have so much to be thankful for, but it is still devastating. The forest, the animals, the river, the lake, the spawning sockeye, it will never be the same. It is sad to think about the destruction. I’m digressing though. I wanted this blog post to be about something you can do to help people in tough times. There were a lot of people who offered to help while my parents were evacuated and it was all so appreciated. Having experienced a tiny bit of it with them, I wanted to share my experience with you. You know that feeling when you want to help during a tough time, but you just feel so hopeless and don’t know what to do? I know there’s been a lot of that around here lately with my parents and so many of their friends also being evacuated due to the wildfires. Everyone wants to help, but it’s hard to know what to do without being a bother. I love to be able to help when I can, but I also want what I give to be useful. I know with the Fort McMurray fires they were overwhelmed with donations and they couldn’t use it all. I don’t know if there is any truth to this, but I had heard donations were being sent to the landfill because there was just too much and they didn’t have enough resources to sort through it all. I get it, but it breaks my heart to think that peoples hard earned donations would be sent to a landfill. I have donated money to Red Cross in the past, but I am also a bit careful about donating money because I’m skeptical about where it goes. And I don’t mean that in a bad way, I just want to know for certain that the money is going where it is most needed. So this is my long rant to say that if you want to help someone then bring them food! Homemade or not, doesn’t matter, just bring food! When my parents were evacuated the first time, they got out of the cabin late at night and I went to see them the next day. My brain was spinning a bit and my first instinct was food. I pulled everything I could out of the garden and took a fresh basket of veggies. The next morning the neighbour brought fresh baked muffins (still warm) and they were the best muffins I had ever eaten! I think they were all gone before she even left. The following day she brought fresh baked raspberry scones and my goodness they were amazing! A few weeks later when my parents were evacuated from both their properties and staying at my house we had a family friend come for supper and they brought all the food and fixings for chilli and salad and it was just what we needed. The thing is, when you’re going through a tough, stressful, hard time or whatever it is, you may physically be able to cook, but mentally it really is tough. Your mind is elsewhere, it’s hard to concentrate or think as you are preoccupied by so many other things and before you know it, it’s meal time. Then you have to figure out what you’re going to cook, if you have the food and then you have to be able to focus long enough to make the meal. Honestly, it really is harder then you think. The food that was brought to us was so much appreciated. I’m very thankful I was here this summer to be closer to my family and be able to help out in this time of need. I know it has been so stressful for them and although my house isn’t as quiet as they are used to, I know it was better then living in a hotel for weeks! I was also really happy that they could be out of the smoke for a few weeks as that has physically been tough on so many people, not only in BC but across our country and even further! 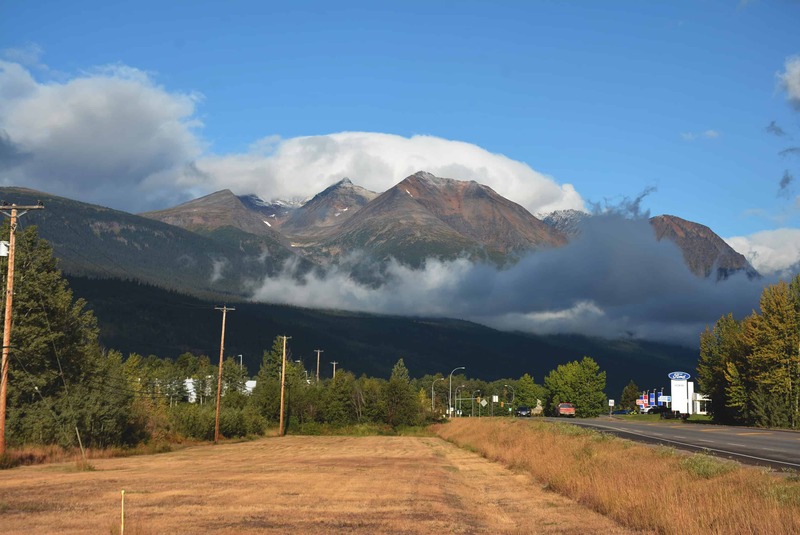 We have been so incredibly blessed in Smithers to have only had a couple smokey days this summer. For the most part, we’ve had this amazing view. There have been lots of times where I wanted to help another friend, family or acquaintance out. It’s just human nature when you see someone who’s having a tough time to want to help out, but it’s not always easy to find the right thing or know what’s helpful for them. If a family member passes or someone is pregnant, has a baby or miscarriage or maybe someone you know hasn’t been feeling well or just having a tough time I think food is always such a nice gesture that can always be used! Fresh baking is always good, but I love to give meals when possible. There’s always frozen meals you can buy when in a pinch or you can make a fresh or frozen meal yourself. It’s nice if you can make a meal that doesn’t have to be eaten that day either, then you know it won’t be wasted. I dropped off a meal to a family friend who had also been evacuated this summer and I put homemade spaghetti sauce in a jar, Caesar salad in a bag (without dressing), a package of uncooked spaghetti noodles and garlic bread that was ready for the oven. Even though there was some cooking required on their part, it just took the thought and stress out of planning a meal. I also didn’t know what they had planned for supper, so it could have been saved for a couple days. In very sad times where a lot of people may be providing food I think freezer meals are an awesome option. That way when its a week later and most of the support has disappeared you still have a little extra “help” saved in the freezer. Home canned goods would be nice in this situation too. So I say, when in doubt, bring food! What’s your go to thing for helping someone out?